Some days, we cast and hook up on seemingly every cast. Other days, it’s like we’re casting in a dessert, expecting to hook into a camel. Fishing. Why do we do it—well, I think we have to be optimists to get ourselves out the door. Sure, fishing in a dessert is part of the game, but we, as anglers all hope for those days of “stupid fishing”, when no matter what we do, or how we do it, we get bites. Those are the fun days, no doubt about it! And they’re also the days that our arms get tired from catching, and not just fishing. That being said, however, these are also the days to not only enjoy to the fullest, but to learn. It’s during a hot bite that I experiment with off-the-wall ideas to see whatever else works. Not only does this eliminate dud ideas, but can help hone techniques and bait presentations, giving us confidence in these techniques when we encounter the dreaded tough bite days. Such was the case the past several days. Most of July and August, we here in northern Michigan, experienced very little rain, leading to extremely clear, low water conditions. The past 2 weeks has had a lot of rain. In fact, the past week has had well over 6 inches of rain, leading to very high, muddy flood-stage water levels on all of the area’s rivers. The Big Manistee River was no exception. Higher water levels on the rivers in the fall lead to fish such as salmon and steelhead to enter the rivers to spawn. Low clear water, by contrast, makes fish wary, and makes the spawning runs meager and not as predictable. High muddy water makes fish a little more predictable, but not necessarily any easier to catch. The past few guide trips on the Manistee River has been like trying to fish in hot chocolate. Muddy, lots of leaves and debris floating down river, and fish on the move up to Tippy Dam. Under normal conditions, the steelhead that come into the river in October stage in various holes and runs as they meander their way up to the dam, where they spawn. High, muddy water forces fish out of their typical routine, keeping them on the move. As anglers, high muddy water must force us out of our typical routines as well, making us fish water that we might not typically, looking for the shallower runs that fish use as they move up river. The bite was extremely tough during the highest water. Most tactics didn’t get a lot of bites, but we did manage a few. By putting the right presentations in front of inactive fish, we were able to get a few to react positively. Whether it was out of hunger, curiosity or aggression—at the end of the day, it doesn’t really matter—we got some bites. But paying attention to cues that the conditions give us can help trigger some of these bites. 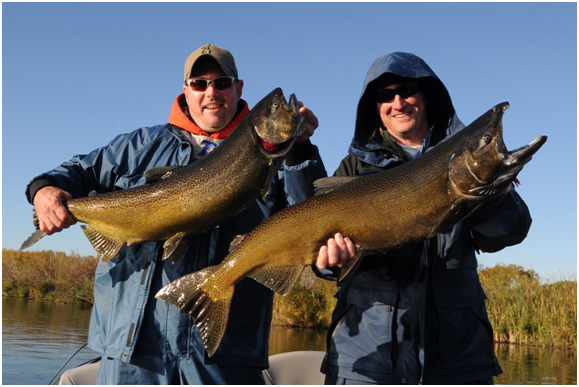 Rich and David with early morning late-season king salmon. We have no idea if the early bird got the worm, but these anglers got the fish! Part of being a prepared guide, fishing with customers for salmon and steelhead, is having the right equipment and bait. My favorite trips when fishing with my Manistee River Salmon Guide Service, are the ones where I have a strong crank bait bite where we can cast deep diving crank baits like the Storm Thunderstick Jr. for truly ferocious strikes. Salmon in the rivers don’t really feed on the forage that they fed on when they were in the lakes and oceans. It has been scientifically proven that some salmon will eat 10-12 eggs a day to try to maintain body weight, and fat conditioning while fighting the current. 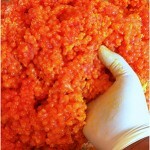 10-12 salmon eggs a day is like me eating 10-12 kernels of popcorn. Then again, I’m not fighting current, trying to spawn. What salmon do, however, is become terrifically territorial, and a slowly moving crank bait invading their space is met with a killing instinct that we as anglers absolutely cannot get enough of. They don’t nibble, they don’t half-heartedly bump; they simply try to kill. Talk about a fun bite! Bent hooks; shaking knees; stuttered speech; 4-letter words and big smiles are all indicative proof of a salmon trying to kill a crankbait that was cast by one of my customers. It’s truly unbelievable. People can’t believe the power and the sudden ferocity of these strikes. Oh, and it’s purely addictive. Despite the addictive nature of getting bites casting crank baits, one other thing that I use as a guide are the use of cured salmon eggs. Depending on how many eggs need to be cured, I may spend 2-4hours daily curing eggs for the week’s trips. This is a messy and lengthy process by which I carefully bleed out the egg skeins, trying to drain as much blood as possible. Cures are able to handle the curing of the eggs, but not the blood, which will taint the final product. Properly cured eggs, that are free of blood are absolutely essential to getting the number of bites that customers rely on me for. Although it takes a lot of time after guide trips, being able to put my customers on additional fish that bite these cured eggs is priceless. Whether it’s fishing big chunks in skein form, or tied into small spawn sacks with only a few eggs in them, it’s all part of being the best guide that I can be. We as guides always have to be able to say to a customer after the end of a guide trip that we tried and did everything that we could to maximize our bites and opportunities. 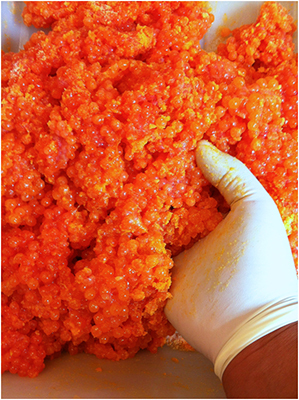 Curing 10 pounds of salmon eggs. This started with perfectly bled out females, egg skeins that were carefully cut out of the hens, then the skeins were bled out and drained, and butterflied all prior to adding the secret curing ingredients. It was a distinct pleasure to have Traverse City Bass Guide Service film a television show this past week. Conditions were extremely tough, but we figured out a way to make something work. 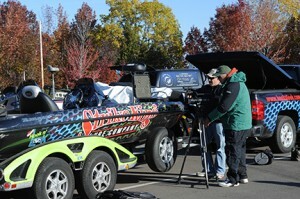 Kim Stricker and his son, Danny, came up to film for their show “Hook N’ Look” with me at Traverse City Bass. I’ve known Kim for a couple years, and we chatted for a while earlier this year at the East Bay boat launch in Traverse City. At the time, we discussed possibly filming a fall show, highlighting the aggressive nature of fall smallies by doing a spinnerbait show highlighting the Tour Grade spinnerbaits made by Strike King. It was truly wonderful to welcome my friend back up to northern Michigan to film for his show. We had already delayed the shoot by several days due to bad weather, and unfortunately this time, it looked as if we were going to have to just shut up and fish (and film). Naturally, all of the best planning in the world can’t account for Mother Nature’s ultimate decisions. Cold, windy, rainy conditions meant we were going to be filming in cold, windy, rainy, rough weather. I was pumped—I knew there would be some fish up in the mid shallows, and with the wind, this was going to be perfect for a Strike King spinnerbait show. A few days prior, I contacted one of my other Sport Fish Michigan Captains to operate my own bass boat, which would function as the camera chase boat. Captain Kyle Buck drove up from Muskegon to be my camera boat driver. There were a couple of closer choices that I could have used within my network of Sport Fish Michigan network of Captains and Guides, but Kyle has a long history with foot-controlled trolling motors, and operating bass boats. Prior to becoming a licensed Captain, Kyle fished nationally in bass tournaments. Originally scheduled for a 2 day shoot, yet hoping to accomplish everything in 1 day, we all met for breakfast on day one and talked strategy, weather, and shot the breeze for a while, letting the sun get up to warm things a bit. It was a chilly 37 degrees when we met that morning. Again, the best laid plans are sometimes ignored by Mother Nature. Our 2-day shoot turned into a 3-day shoot, as we fought the weather tooth and nail, trying to get the shots and video needed. Having great outdoor gear is important, and for a time like this, it’s just as crucial. Not wanting to look like a total marshmallow or the Michelin Man, I opted for my Simms Fishing Products long underwear underneath regular clothes and my Simms Pro Dry bibs and parka. And naturally, I wore my Traverse City Bass hooded sweatshirt for good luck! Kim and Danny Stricker setting up a shot to highlight Deep Blue Coffee Company’s coffee prior to launching our boats. 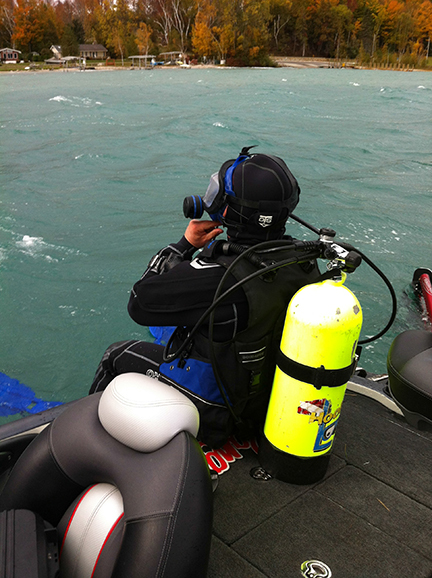 Danny Stricker about to jump into the water to film the underwater portions of Hook N’ Look. 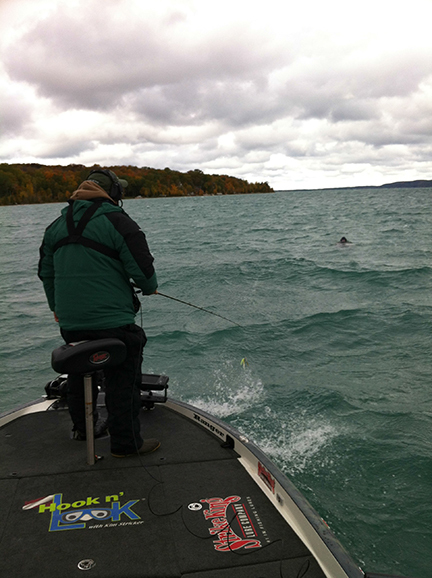 Battling the wind and the waves in the Traverse City area trying to film the underwater segments for Hook N’ Look, which airs on the Outdoor Channel. What an incredibly busy month we have had this past month. Fishing every day, and flip flopping between my two guide services, Manistee River Salmon Guide Service fishing for king salmon on the Big Manistee River and my Traverse City Bass Guide Service guiding on Grand Traverse Bay in Traverse City. We have attracted some media attention, which is always welcome. We filmed 6 small 2-minute segments with “Michigan This Morning”, a local morning show. 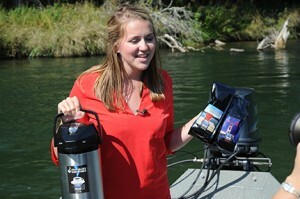 During the filming, we highlighted both my coffee company, Deep Blue Coffee Company, and my 3 guide services. Despite beautiful weather conditions on the Manistee River, we struggled to get bites casting crank baits for the king salmon lurking in the deep holes. Bring out the cameras, and the fish get shy! Typical stage fright on the part of the fish, I’m guessing. Not to make excuses, here, things were set up a little bit against us. For casting crank baits, we as anglers and guides rely on a couple of things to help us. First, we need plenty of fish in the system to really make the crank bait bite shine. Lots of fish makes the salmon even more territorial, and we did not have a lot of salmon in the deep holes that day. Secondly, due to the filming, we needed lots of light to allow the high definition cameras to do their best. The ultimate crank bait bite occurs the first half hour prior to first light through the first hour after sunrise. 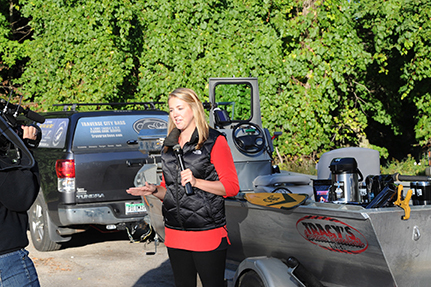 For this morning show, we were taping live, so we didn’t even get onto the river until 9am! Not an early start at all. On the day, we filmed with my Wolfe Outfitters head guide, Matt Dunn, and Kalin Franks, the host of the “Michigan This Morning” show. Stephanie Adkins did all of the camera work, as well played producer. It was a great experience to pull in to the parking lot at Bear Creek, one of the launches where we have Federal permits, and have all of the other boats already well on their way, leaving the parking lot and ramp empty for us to film. Kalin started out by interviewing me, introducing Deep Blue Coffee, talking a bit about the coffee company prior to launching our boat. We chatted about how I got into the coffee business, and what I offer my fishing customers each morning with my coffee. After launching the boat, we ran to a few different spots, where I showed Kalin and Stephanie how we cast crank baits to the king salmon that inhabit the Big Manistee River in the fall. We did a few more interview segments to fill out the segment times, discussing everything from casting basics to cured egg presentations, to the great fisheries we enjoy in northern Michigan. Despite not having a good bite to really showcase, we had a terrific time fishing with Kalin and Stephanie. We shared stories and laughed a lot—much of which is probably good not to have captured on film! Thanks Kalin, Stephanie, Matt and “Michigan This Morning”. And last but not least, it was fun and interesting to watch the segments the next day. I used my DVR to record the segments, since I was out on another guide trip, and watched the “Michigan This Morning” show that evening with my parents and wife. Exciting to see it all come together. Kalin Franks introducing Deep Blue Coffee. Kalin and I discussing the finer points of cured salmon eggs for bait. Plugging the Deep Blue Signature Blend; the Cottage Morning and Great Lakes Blends.